Safely Remove Oil, Grease, And Other Hydrocarbons From Bilges Using Naturally Occuring, Oil-Eating Microbes. 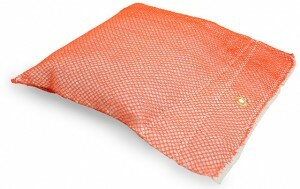 Main Compartment Of Pillow Contains Ground Peat Moss Which Quickly Absorbs Any Oil (Up To One Quart) That Is Present In The Bilge Or Containment Area. Ultra-Microbes, Housed In The Pillow’s Top Flap, Once Exposed To Water, Will Begin To Break Down Any Hydrocarbons In The Peat Moss And Surrounding Water Into Harmless Fatty Acids, Carbon Dioxide And Water. Fits In Most Bilges And Other Void Areas. Included Tether And Grommet Can Be Used To Secure Pillow And Make It Easy For Later Retrieval. Dimensions: 13″ L X 11″ W X 2″ H.